Hello there! Happy New Year's Eve! 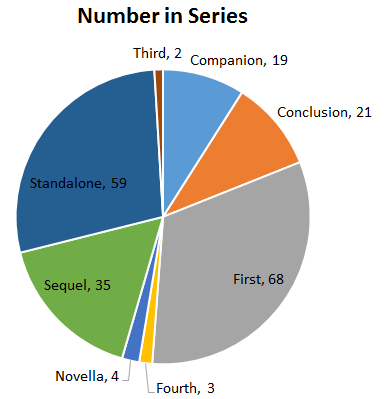 Like last year, I'd like to share my end-of-the-year statistics roundup with you all. 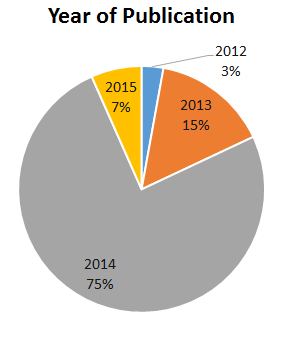 2013 was a great year, and 2014 was an even better year, in terms of blogging (in terms of life, not so much). - Age Level: I obviously like reading YA books. - Publisher: HEY THERE, HARPERCOLLINS! 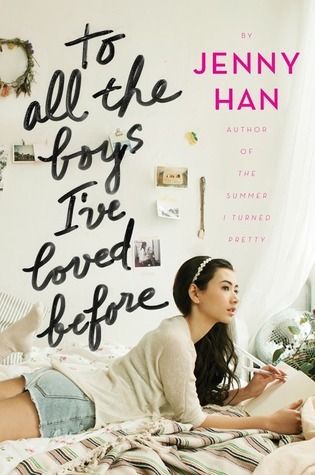 This only includes the TEEN imprints, like HarperTeen, Balzer+Bray, Katherine Tegen, etc. Notice that I put Avon in its own category. But Avon is an (adult) imprint of HarperCollins. - Rating: Wheeeeee, four stars. But I had more two-star ratings than last year, and less five-star ratings. - Source: Publishers sent me more physical ARCs this year (thank you! 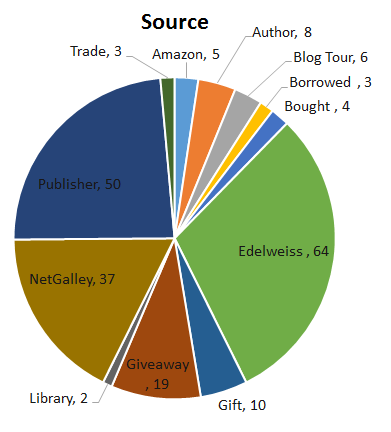 ), but Edelweiss and NetGalley are getting a lot of love too. Basically, I read a lot of review books. 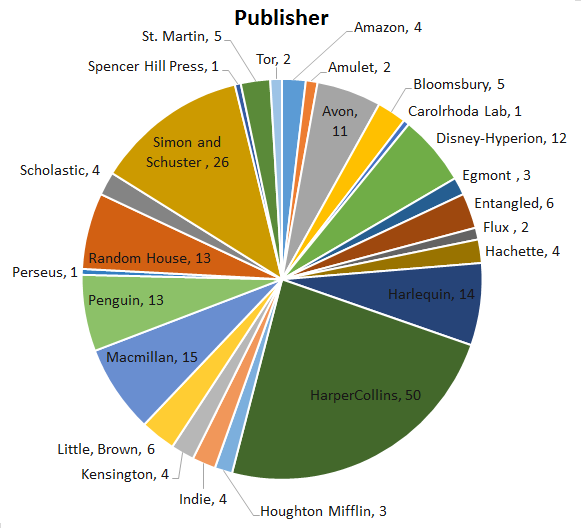 - Year of Publication: 2014 dominated, in terms of pub year reads. As if should have. The sea is coming. We are coming. And we will drown you all. With a song, Lucy can control the wind and the water; she can bring castles and kingdoms to their feet. Since Lucy mastered her powers, King Henry has kept her close as he’s rebuilt England. She’s his best ally—and his workhorse. And now he’s called her to investigate attempted murder: His men claim they were almost killed on the Thames…by a mermaid. All Lucy can glean from the creature they’ve captured is a warning: The sea is coming. We are coming. And we will drown you all. Lucy is determined to defeat this powerful new magic alone if she must. 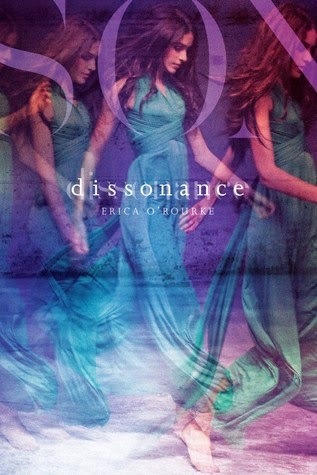 But then she hears an eerie song within the water…can it mean that she’s not the last Chantress after all? 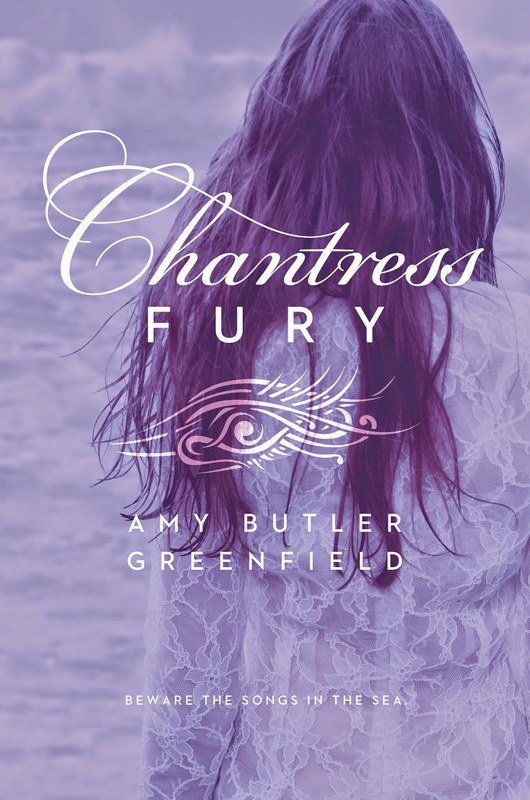 Sweepingly romantic and crackling with magic, Chantress Fury triumphantly concludes the powerful Chantress trilogy. Oh come on. You all must know by now how much I LOVE this series! 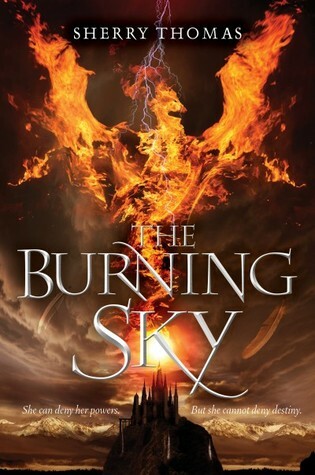 Remember the exclusive cover reveal? Chantress and Chantress Alchemy are awesomeeeee. 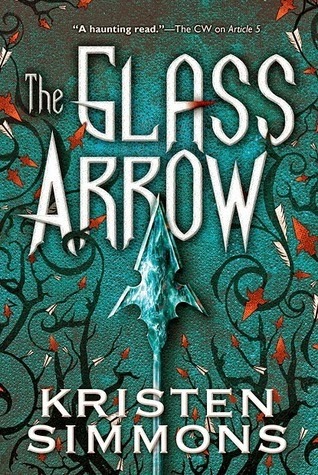 I can't wait to read book three! Check it out, 2014 is almost over. This year has been very... not so good, for me. Holistically, I've wanted it to be over for quite some time. I think it started out alright - I distinctly remember New Year's Day, January 1st, 2014, and being HAPPY. There was a specific reason, and it made me so happy. Tuck in, y'all. This post is about to get really deep and personal. January 2014 was good. February 2014 was wonderful. March 2014 was fine. April 2014 was rocky. May 2014 was a rollercoaster. June, July, August 2014 were a blur. September 2014 was tumultuous. October 2014 was heartbreaking. November 2014 was numbing. December 2014 was hopeless, resigned, and now, over. On the blog-front, you'd never know that I've suffered so, over the past year. I have yet to miss a day of posting on the blog. 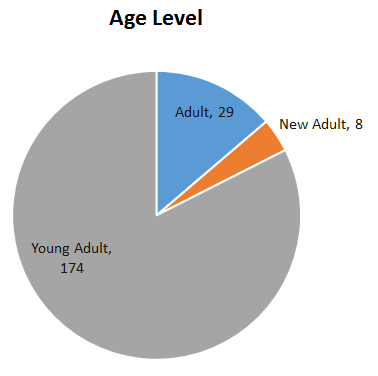 I read 211 books this year - 30 more books than last year. I published 211 reviews this year. My statistics and numbers are doing super well (see my post tomorrow). But personally, in my "real" life, things were black and stormy and not good at all. You may have noticed that I posted a progression of personal posts this year - something I unofficially promised myself that I would never do. In April, my computer crashed and I was stressed about finals and things seemed awful (little did I know what was coming for me in September). In May, I sort bounced back, right? Things seemed better, especially since I got my computer back, and finals were over. At the end of May/beginning of June, the BEA thing happened, and, well, that was that. At the end of August, I was frustrated, on my first day of sophomore year. There were several catalysts for this not-so-great year. Academics, for sure. Engineering isn't easy, double-majoring isn't easy, Johns Hopkins isn't easy. But, there was also the matter of my gilipollas boy. For those of you who don't understand that reference, don't worry, you're not alone. I sparsely mention him on the blog. In September 2013, as a freshman in JHU, I met him. I bet he doesn't even remember how we met, but... I do. I was sitting outside one of my new friend's suite (with the friend), talking with the friend. We'll call the friend "B". B's suitemate, Matthew (who is now one of my best friends), was in the suite. A boy walked out of the suite (my gilipollas boy). I stood up and introduced myself, and asked him his name. He said his name was "Pablo", and he was from Australia. Neither of which was true, and I didn't believe either statement. I laughed it off and he left. He wasn't quite a jerk - he looked me up and down and made that stupid joke, not once introducing himself to B - but he wasn't someone I thought I'd like. Of course I ended up liking him... entirely too much. We grew close over the course of the semester. I'll leave a lot out. Fast forward to fall semester. Spring semester was good. Summer was fine - the months not seeing him (or anyone from Hopkins) weren't so bad. But fall semester... immediately, from the start, there was something wrong. He stopped texting me. He stopped seeing me. He stopped talking to me. He ignored my texts, my attempts to see him, my attempts to communicate. I wanted to know what happened, but he shut down and shut me out. September, October, November, December... I still have no explanation as to what happened, not from him. We have mutual friends, so when we saw each other, we acted like nothing is wrong. But something was so, so wrong, and he refuses to talk to me. The thing is, I'm still nursing a broken heart. I miss him. I miss the boy to whom I told everything. I miss the sweet guy who held doors open for me, listened to me chatter endlessly, made fun of me (kindly) when I got excited about environmental chemistry, teased me about silly things, watched soccer with me, talked me through anxiety and panic. I miss hearing about his practices, how one guy was annoying, or one guy smelled terribly, and so on. I miss his harsh exterior but sweet interior - he always wanted to appear as a tough guy, but I always thought he was a teddy bear inside. I miss his terrible language (he's got a potty mouth), his loudness, his charisma, his magnetic personality... heck, I miss how he loves Barcelona (and I love Real Madrid), how he's from Pittsburgh (and I'm from Baltimore). I miss everything that was so opposite of what I am. I miss too many things about him. I left a lot out, especially from freshman year. But... we're done. I've let him go. I can't remember the last time during this year that I was HAPPY. I missed him, all throughout fall semester (2014). I MISS him now. It hurts to be cut out, and to cut someone out of your life. Especially someone so close. So... that was kind of what was going on with me, throughout the year. It was always a rollercoaster, with him, and now, the ride is over. I don't live near him anymore, I have no more mutual classes with him, and I won't be hanging out with our mutual friends if HE will be there. Childish, maybe, but I can't let myself hurt like that. The thing is, it's a beautiful thing, to love someone else. There is nothing to be ashamed of, even if it doesn't work out in the end. I wish things could have ended better between us, but I refuse to feel ashamed or guilty for caring about someone else so much. So. Do I want a do-over? Yes, please. 2015 will be a fresh start for me, in many ways. Mostly in terms of my personal life, but in other ways as well. I'll be focusing on me, my academics, my career pursuits, and my health. I will not let a boy destroy my happiness so completely again. I will not let a boy disappear from my life so absolutely and take all of the light and warmth with him. I will not let myself become so dependent on someone else, because in the end, people always leave. I've always known this, but I wanted it to be different with him. Mistake, Alyssa. 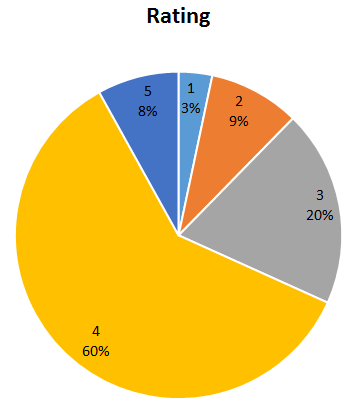 What does this mean, in terms of books and reading and blogging? Nothing. Just had to get this off my chest, so to speak. I've learned not to feel stupid or ashamed of feeling the way I do. I've learned that talking to people about this whole thing is a whole lot easier than keeping it to myself. And I've learned that I deserved none of this, and that I can do better. So... to all of you wonderful people out there who suffered some sort of heartbreak this year, cheers! We'll be miserable together. And then we'll be just fine together. Woohoo! Two years feels like a long time, and yet, no time at all. A lot has happened in two years, and in the last year specifically. 2014 and I have not agreed on most accounts, and I can safely say that it was my worst year yet, blogging/academics/personal/family/otherwise. But I really could not have made it through the year without so many incredible people, events, actions, gestures, kind words. As cliche as that sounds, it's so true. Like last year... I'd like to do my Grammys/Oscars/Academy Awards Thank You Speech. But first, let me share with you some blogging milestones/achievements that I have hit over the two years of blogging. - Have not missed a day of posting... at all. Yet. Ever. People. Thank you all, every one of you, who followed my blog, viewed a post, commented, tweeted, pinned, posted, liked, favorited, etc. I see every interaction, and I respond to all of them, and I love them. I love you all. With such a demanding academic career, it's easy to see why blogging and reviewing and reading is so important to me - my escape. So, thank you all for being here. My IRL peeps: my parents, my sister Lily, my friends at home, my friends from Hopkins (Nicole, Christina, Matthew, Bria, Sophia), my amazing roommates/friends Adrienne and Janay, my gilipollas boy (who caused me so much grief this year, but I had to include him here for certain reasons) ---- THANK YOU. To the authors, publishers, publicists, editors, reviewers, bloggers, booksellers, librarians, and anyone involved in the literary world - you all rock. And I like you a lot. I respect the heck out of anyone who devotes time and passion to something as simple yet crucial as reading. THANK YOU. You've survived my speech! I think it was slightly shorter than last year's, but I hope it felt just as meaningful and sincere. So, for the giveaway prize. I have this giant box of ARCs. I have no idea how many ARCs there will be in this box - I'll just grab a box and fill it. Probably more than ten. This giveaway is open to ANYONE - USA, Canada, Bhutan, Venezuela, wherever. Void where prohibited and whatnot (see Rafflecopter for more terms and conditions). Also, the lovely publicist at Disney-Hyperion has offered a couple of prizes! One winner will win one copy of The Darkest Minds, Never Fade, and In the Afterlight. Another winner will win one copy of Dark Metropolis, and one copy of The Ring and the Crown. Both prizes may involve a mix of finished hardcover and paperback copies. USA and Canada ONLY. USA and Canada residents may enter all three giveaways, if they so choose. So, three winners total! The giant box of books is open to ANYONE, the next two giveaways open to USA and Canada residents ONLY. Which means that USA and Canada residents may enter ALL THREE giveaways. Read the GIVEAWAYS page and/or the Terms and Conditions in the Rafflecopter. Good luck! And THANK YOU! I never read The Handmaid's Tale (one of my friends LOVE it though), nor did I ever make it to the end of Blood Red Road (I really tried...), so the comparison in the synopsis is wasted on me. But back in mid-2013, when I saw that Kristen Simmons was writing a new book, I added it without question. It worked out for me in the end, because my last read of 2014 just so happens to be a rare five-star read, and a favorite! Aya has been captured from her home in the "wild". She will be bought by someone in order to be bred, to have a healthy son. Females who can produce healthy children - specifically, males - are scarce. With the help of a Driver, she will attempt to escape her buyer, and find her family before they are captured and sold like she was. I LOVE THIS BOOK. I love Aya. I love Kiran. I love the story. I love the world-building. I love the romance. I love the ending. I love the cover. 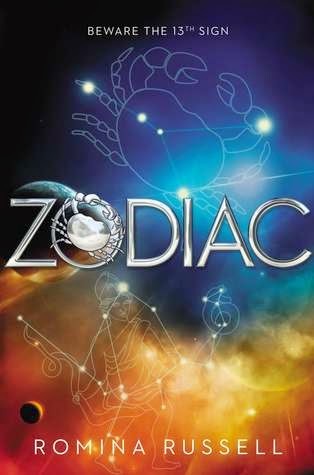 I loveeee this book. Just about everything is wonderful. I'm a big believer in "nothing is perfect" and "every book has its flaws" but at the moment, I'm basking in the "this book was so awesome" glow. Aya grew up in the woods. She didn't live in the city, where people get their meals via a meal pill. This is why her womb is so valuable - she has a more "natural" body, and is more fertile. She is captured by businessmen, and taken to the Garden, where she and other girls are auctioned to the highest bidder. Aya does everything to avoid the auctions - she injures herself and gets into fights, to avoid the auctions. In her most recent stunt, she lands herself in solitary, where she makes the acquaintance of a mute Driver (whom she names Kiran). Kiran isn't in solitary - he's a Driver, and he's not confined. But Aya talks to him (though he can't talk back). When Aya is finally auctioned, she is stunned because she has been sold. She has to leave behind a dirty wolf (whom she named Brax)... and Kiran (whom she nicknamed for the color of his eyes). But as it would turn out, Kiran is neither mute nor stupid. He is an integral part of this book. Aya is such an interesting protagonist. She is naturally more spirited and "wild" than the other girls in the city, but for a reason - she is from the outside. She never stops trying to escape, to fight back, to think of how to overcome the obstacles in front of her. Aya is so SMART. Clever, inquisitive, determined, brave. I like her a lot. There are several parts to this story. Aya gets captured (and eventually meets Kiran); Aya gets sold and leaves the Garden; Kiran finds Aya and helps her escape; Aya and Kiran try to find Aya's family. 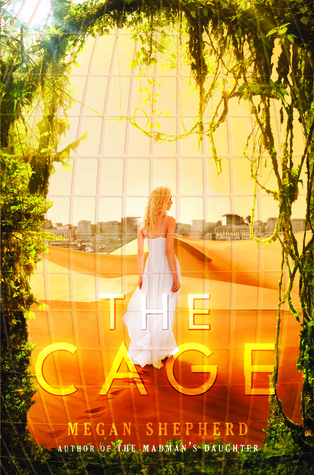 I loved each part of the book, but my favorite would be when Aya finally escapes captivity - all of the captivity, when she leaves the city. The book isn't over yet, by any means, but I breathed easier when they left the city. 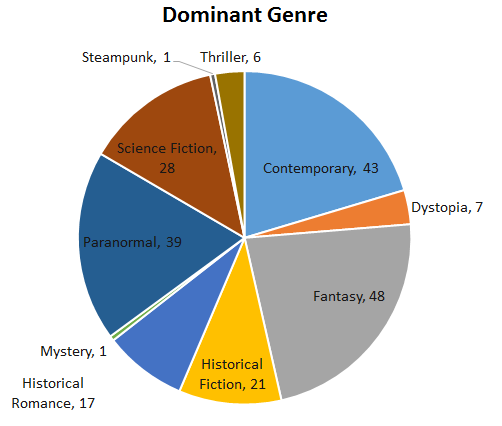 I had a hard time coming up with the primary genre for this book. It seems like it could be set in a futuristic city, because there are guns and technology that made me think of a futuristic place. The meal pill seemed really advanced. But it had a heavy fantasy feel to it - not epic fantasy, but fantasy nonetheless. Either way, I LOVE the world that Simmons has created. She masterfully created the setting, both in the wild and in the city. The romance - oh, how I loved the romance. No love triangle, no insta-love. It amazed me how easily I fell for Aya and Kiran as a couple, in the beginning, with Kiran being mute, and the two of them barely interacting. Yet, they interacted so much in the beginning, and Aya felt his "loss" when she was sold. Then Kiran helps her escape, and they leave the city, and it's not like they immediately confess feelings for each other and that's that. NO. Aya and Kiran go through a lot before they finally let their guards down and let each other in. Love! One thing that Simmons did that I actually REALLY liked was that she didn't try and have her characters "save the world". I can't say too much (not trying to spoil things), but this story isn't about Aya and Kiran taking down the city, the system, the government, etc. 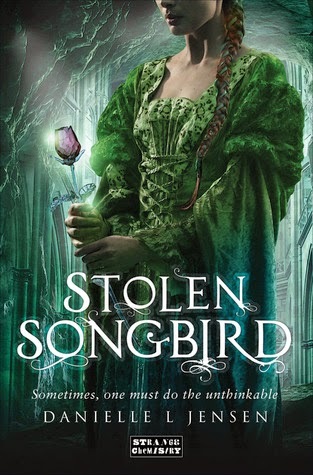 This story is about a girl who was captured and sold, who got out and wanted to save her family. It's a standalone, and it's a fabulous standalone. Simmons didn't try to overdo things. That being said, I LOVED the ending. The last scene, the very end, is so beautiful. At first I thought it was unfulfilled, but then I realized that it was PERFECT. Anything more wouldn't have have made sense, given what we know about Aya, and Kiran. Simmons pulled everything together in the last scene. I loved it! I can't think of anything concrete. I'm sure there's something, but at the moment, meh! YES! 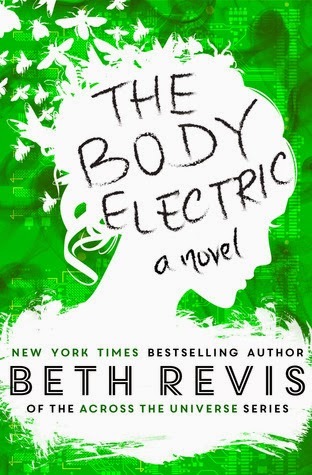 Totally recommended, now go read! I'm actually going to reread my favorite parts right now (there are a lot of them). 5 stars. A rare five stars from me - but so well-deserved! I had a good feeling about this book, and I'm glad that feeling did not let me down! Glad Kristen Simmons did not let me down (as I knew she wouldn't)! USA AND CANADA RESIDENTS: Win a copy on Goodreads! Hello all! 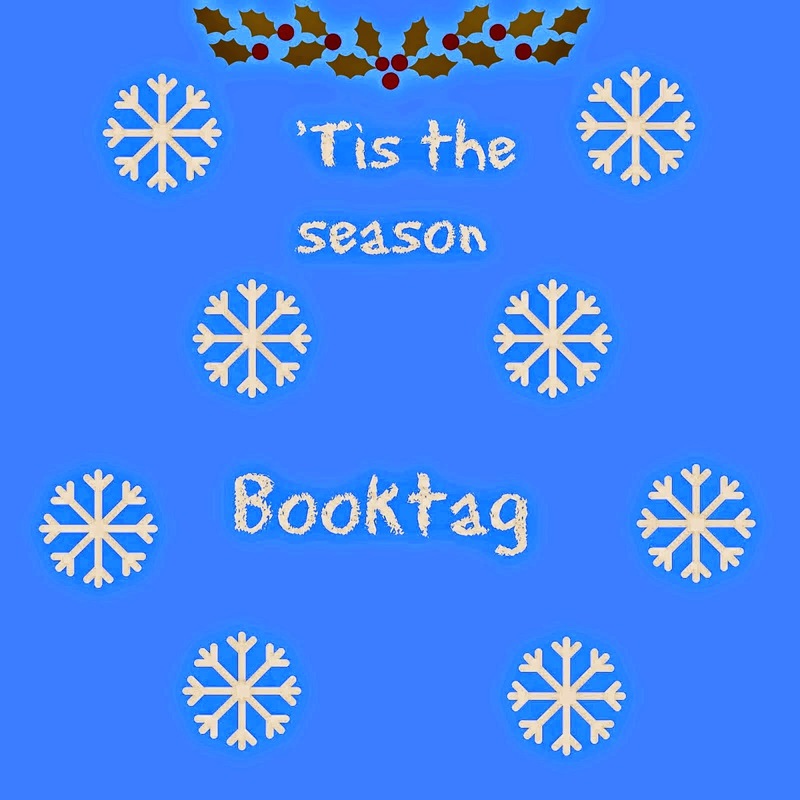 This is my post for the "Tis the Season" book tag. I was tagged by Pili from In Love with Handmade. 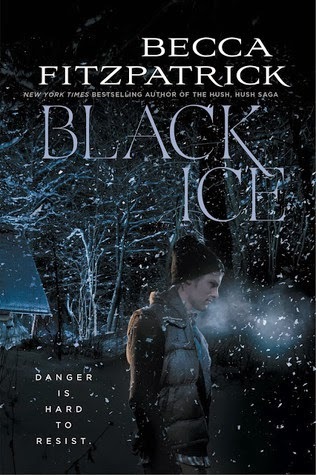 That I've read during this winter so far? 3. Find a book you'd use as the star on the Christmas tree. Probably Kanin! 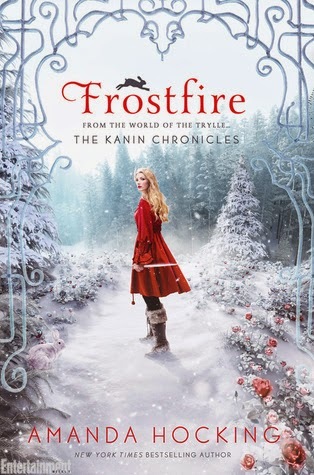 In Frostfire by Amanda Hocking. Welcome bibliovores! I've been tagged by the tag's creators at My Little Corner for Books. Congrats on the two-month blogoversary, Fari and Kitty! I'm actually celebrating my two-YEAR blogoversary tomorrow. Tis the season! 1. Reading in the shower? 2. Say that your favourite animal was the symbol of your godly parent or their creation (Owl, Pegasus! or perhaps Eagle for Roman? From PJO), hate ducks, want a robot as a pet or any such thing? 3. 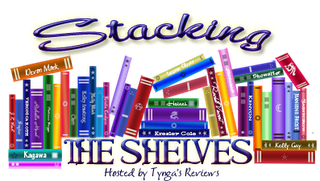 Rearranged shelves at library/book stores? Yup. Both. I can't help it. If it's not in alphabetical order, or if I don't like the face ones (the ones that are turned so that the cover is faced out), then I WILL rearrange things like I own the place! 4. Started a conversation with a stranger cuz they were reading your favorite book? I've never come across anyone reading my FAVORITE book, but I have talked to a random person that was reading a book that I've also read. Not awkward for me, I'm bold! 5. Ruined a borrowed book? Never. Treat unto other books the way you want your books to be treated. 6. Tried to remember all the page number of your favorite passages of you fave book? No, but I remember certain sections. Like, it was three-fourths of the way into the book, or something like that. 7. Had an imaginary convo with an imaginary character? Hmmm, not that I recall? 8. Stopped reading a book to imagine what would happen or wish would happen (even if there is 100% chance of that occurring!)? No way! Let the AUTHOR tell the story! 10. Broke the golden rule and watched the movie first? Hmm... Eragon. I think that was the only time I've ever broken the rule. And it was a HUGE mistake, because the movie was awful, and I couldn't bring myself to read the books, afterwards. 11. Gotten crumbs in the spine thing? When I was younger, I TRIED to eat and read... and then this happened... and I cut that out. That was a bad habit and I do not miss the crumbs in my books at all! 12. Tried to take off sticker and rip cover? Nope. I have gentle fingers and sharp nails. I'm your girl when it comes to books and stickers! 13. Gifted someone your used book? I donate my used books to The Book Thing in Baltimore! 14. Tried to get dressed while still reading? No. I'm very systematic and clear-cut and organized. I love multitasking, but dressing and reading would NOT make my List of Things To Do At the Same Time. I don't believe I've done this! 16. 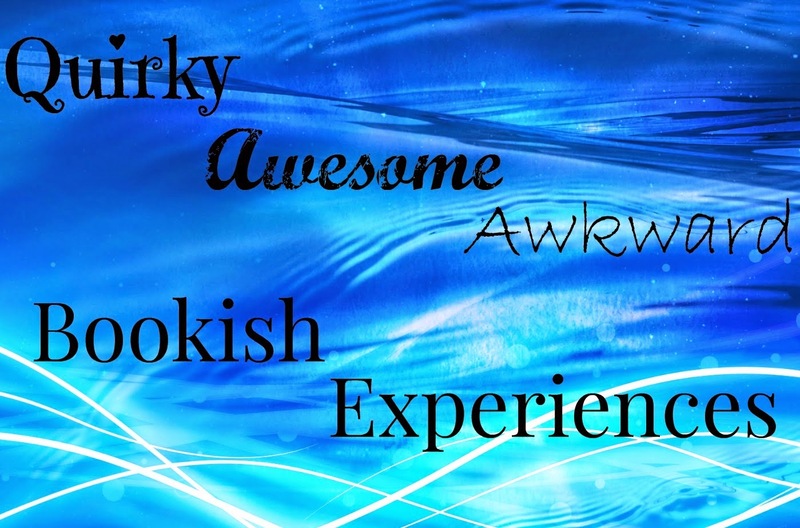 Ever started babbling your list of "Books I Recommend" to a complete stranger because, hey, they love reading too?! 17. Think what your favorite character would do in the situation? No. I think of what I should be doing. In the end, it's up to ME. 18. How many days do you think it'll take you to recommend someone ALL of the books you want them to read? 19. Think your favorite characters as real people. Sometimes. Like, Fire, from Fire by Kristin Cashore. I wish she were real. 20. Recommend books that you haven't read to people? Only to one of my best friends, because I know her tastes and I'm much more well-read than she is. Even if I haven't read something, I might still recommend it to her. And that's that! I'm not going to tag anyone (this one is a long one), but feel free to do the questionnaire and tag others! So, what did I get in the week of Sunday, December 21st to Saturday, December 27th? THANK YOU, NIKKI! 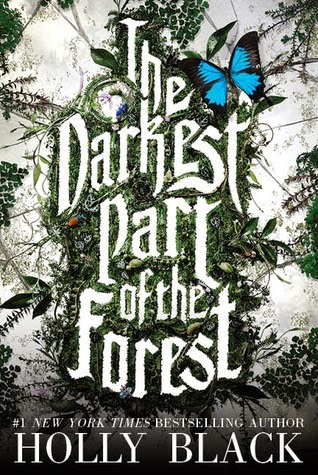 I loved this book so much - and I wanted a hardcover ESPECIALLY since the series got a cover redesign! Nikki is awesome! I've read Shepherd's debut trilogy... 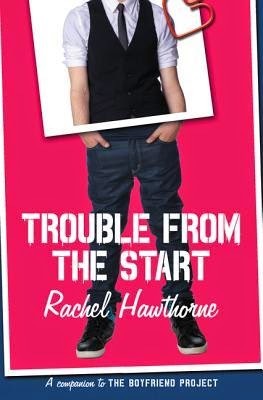 I'm curious enough to want to read her new series! I was browsing through all of Harper's uploaded eARCs... this one caught my eye. It's from a previous mass upload. 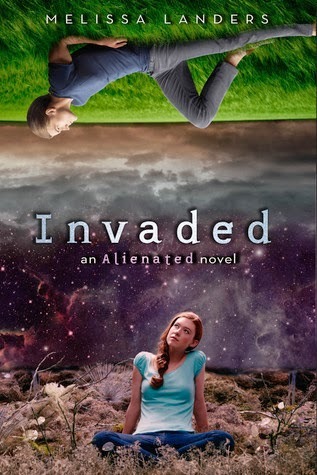 I loved Alienated and Invaded! 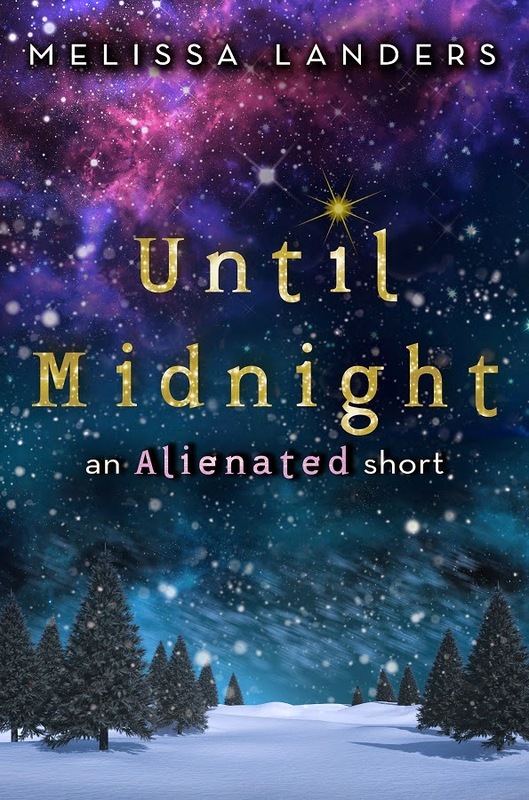 Novella/short story for me!